Journal Journey and Joy! : "Media will control Japanese constitutional amendment referendum." is written by Ryu Honma. 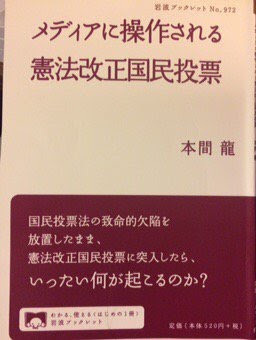 "Media will control Japanese constitutional amendment referendum." is written by Ryu Honma. We will face constitutional amendment referendum in a few years. Japan has already the law to hold a referendum. The law is based on freedom of expression and campaign but on the other hand, anyone can use the money for advertisement unlimited. It causes unfair campaign because, the side which wants to amendment constitution, has much more money than the other side which doesn't want to change. If one side paid huge amount money for media, and the other a little, that makes the media favour for one side. In fact, before 11th Mar 2011 Fukushima disaster, main Japanese media don't report about the danger of Nuclear because TEPCO spends about 30 billion JPY (250 million USD) to the media. People could not avoid seeing the advertisement about on the TV, Newspaper and magazines. Steadily, people, don't dought one-sided report and advertisement. If PM Shinzo Abe holds a referendum now, it's clear that extremely unfair amount of money and advertisement are able to control our decision. We need a limit the amount of spending money, and the advertisement. U.K has the kind of law. We should revise the law. Otherwise, Japanese referendum will be obstructed by the money through media.